Alexandre Gregoire in his army uniform. Date unknown. Courtesy of Liz McClory. Alexandre Gregoire with Devi Cholet. Port-au-Prince, 1995 (Photograph © Anthony Hart Fisher 1995). 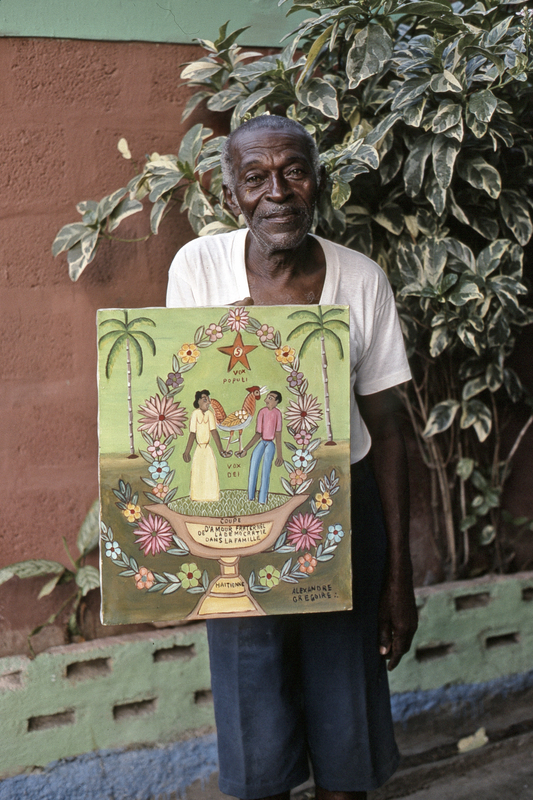 Born August 29,1922 in Jacmel, Haiti, Alexandre Gregoire was one of the last of the 20th century Haitian "primitive" artists. 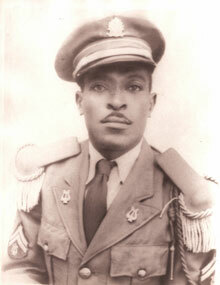 Spent most of his adult life in the army, rising to be a musician in the palace band under President Magloire in the fifties. Introduced to painting by Gerard Valcin at the Centre d’Art in 1968. His work is included in the permanent collections of the Musée d’Art Haitien and the Waterloo Museum of Art in Iowa, and is published in Island on Fire (Demme, 1997). Alexandre Gregoire passed away on July 28, 2001, in Jacmel. You may read a more extensive obituary published by the Haiti Support Network (click to read the obituary).